There’s news in Danish outlet Ekstra Bladet that Newcastle are supposed to have had a bid turned down for Werder Bremen’s Danish International center-back Jannick Verstergaard, who we have been linked with this summer. Everton have also been interested in the player this summer and they are also said to have bid and had their bid tuned down. Both bids were said to be €12M – which is about £8.75M. In any case the German transfer window is now closed, so we suppose the deal didn’t go through, unless Newcastle went in with a bigger bid. There was news earlier this month that Newcastle and Everton were interested in the 6ft 6ins tall defender, but that Werder Bremen were in no way interested in selling a player they had just signed from Hoffenheim in January. 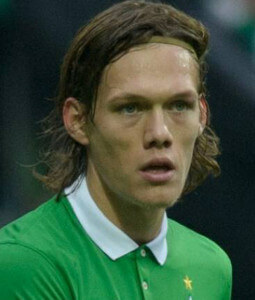 Vestergaard played his youth football at Brondby and started his senior career with German club 1899 Hoffenheim in 2010, before moving to Werder Bremen in January. The 3 times capped Danish International was born in Copenhagen but also qualified to play for Germany because his mother is German. Jannick received his first cap for the Danish senior team in August of 2013, and he described it as his dream come true to play for the country of his birth, when he represented Denmark against Poland. In April of this year Everton were interested in signing the big center-back for around £7M, but at that time Werder Bremen said they were not selling. We would be surprised if Newcastle did bid for the player – because Werder Bremen made it very clear some weeks ago they would not be selling him. This is in all likelihood a regurgitated story from early August. Van dijk to Southampton in the region of 11.5 mil. Moses to West Ham on loan aswell. We don’t have history of signing players on the last day.So i don’t expect any incomings. even Williamson,Marveaux and Goufran.They can be useful one day if we face injuries. I think there’s a slight chance of Lasogga coming in possibly on loan. Only out will be Gouffran to Hull or Derby. If thats the case, then a good summer window. Would love to see Austin fly in later and we get the paperwork done last min, be nice to have some good last min drama of an incoming player for once!! van Dijk is viewed as overrated defender in the SPL.